This post is filed under Frozen, Oven, Pepperoni, Pizza, Sausage, Tomato Sauce, Totino's. Sweeeeet ! 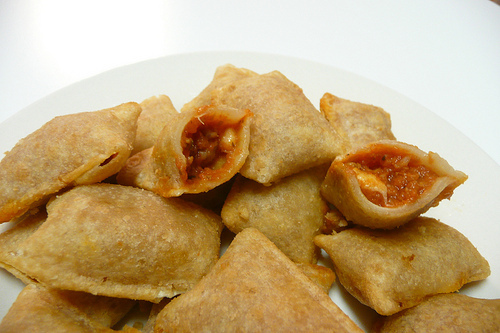 Pizza rolls are the shiz! I haven’t had these in a long time, but this is what I lived on in my preteeny years. 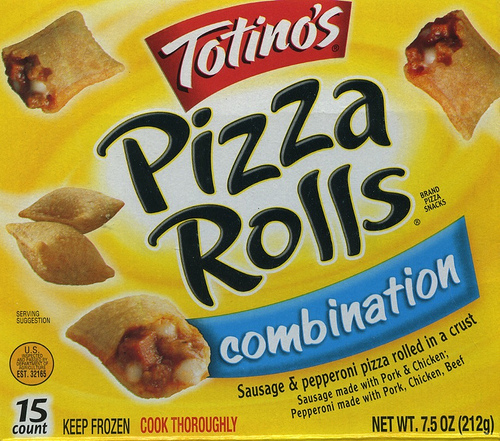 Pizza rolls & toonami, while doing homework. Mad awesome. The best way to cook these is to deep fry them. zomg I totally had these yesterday and burnt the hell out of the roof of my mouth! “Make sure you let them cool off for about five minutes before eating them, or your burnt mouth won’t be able to taste their delicious flavor.” – Haha, so true. These are the equivalent to Capn’ Crunch as far as determent to the roof of your mouth if not revered for their power (and deliciousness). I ate these by the palate full when I was a teen. That’s an interesting idea. Never thought of it.